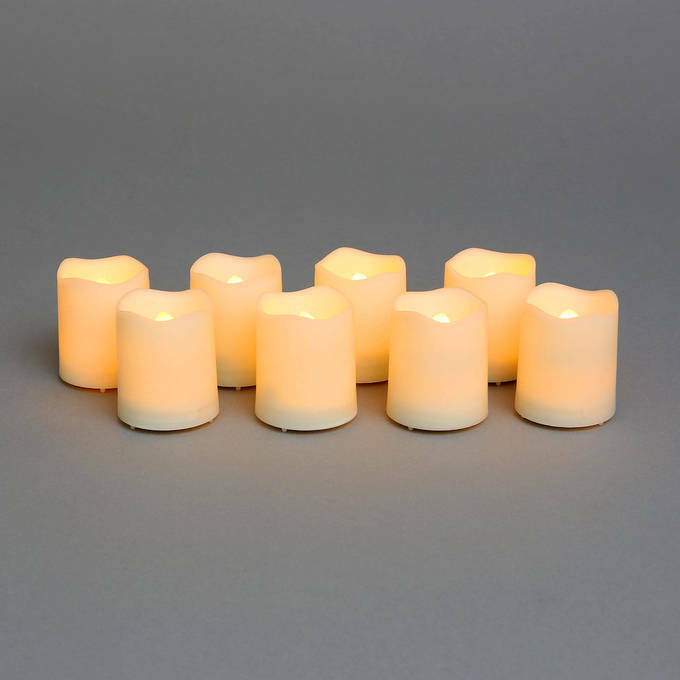 There are only 61 available of the Melted Edge Flameless Resin Mini Votives with Remote, Set of 8. Your selected quantity has been adjusted. 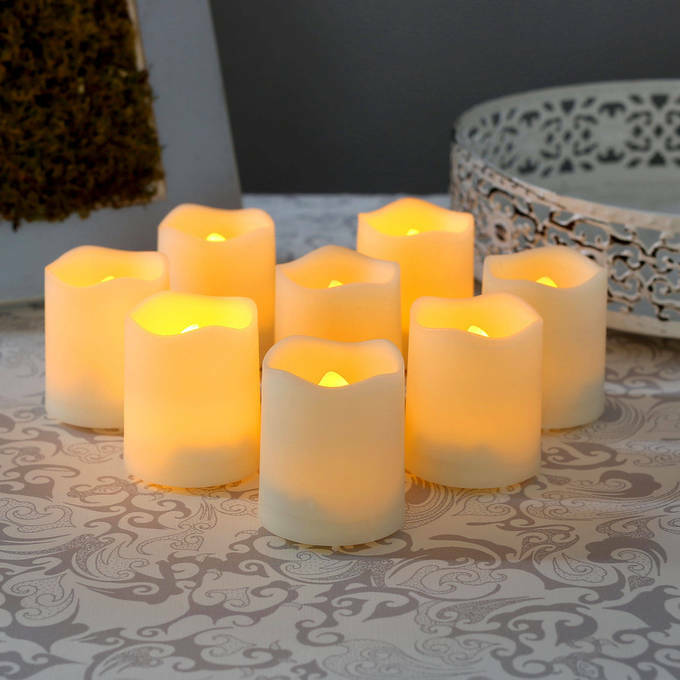 This set of 8 flameless resin votives are a perfect whether decorating for an outdoor dinner party or just adding mood lighting to your patio with a beautiful table centerpiece. 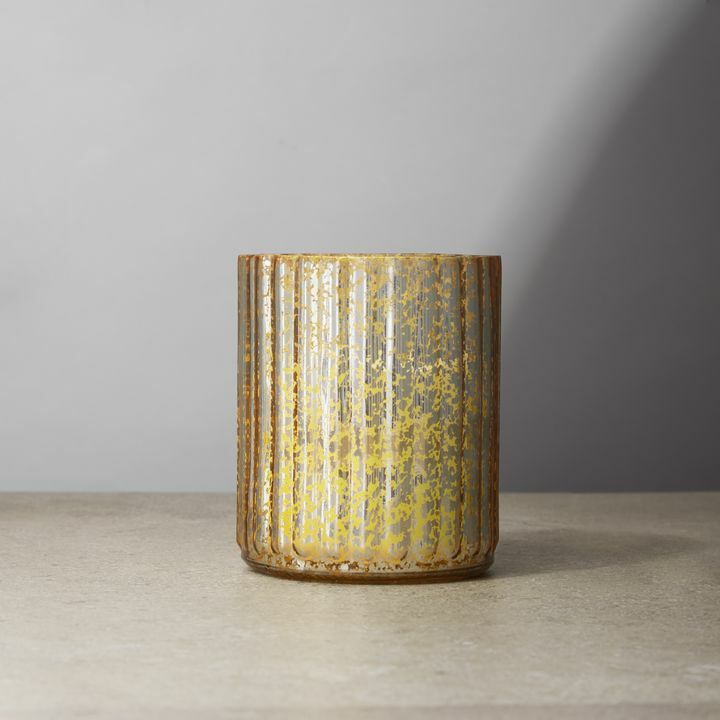 Each candle's LED flickering inside the votive's heavy duty resin body like a real candle, and the included remote, allows you to set the mood from up close or far away. 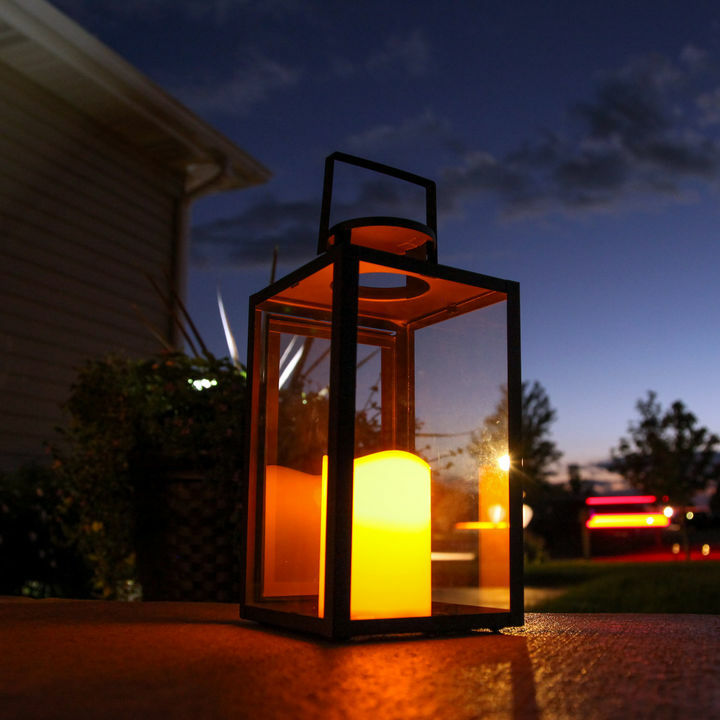 A great candle alternative for both indoor and outdoor displays, you can set these up as a group, or scatter them around where ever additional ambiance is needed. Perfect for home, weddings, churches, restaurants, and events. 1.5" x 1.5" x 2"
The only reason I am not giving you a 5 star is because the battery that came with my remote control did not work and I had to replace it to get my candles to work. Other than that, I love my candles. So love that votives come with remote that has multiple functions. Indispensable! Will never buy another candle that doesnÐ²Ðâ¢t include this feature and priced just right! Nice looking. As described. We are very happy with them and love that they have a remote. 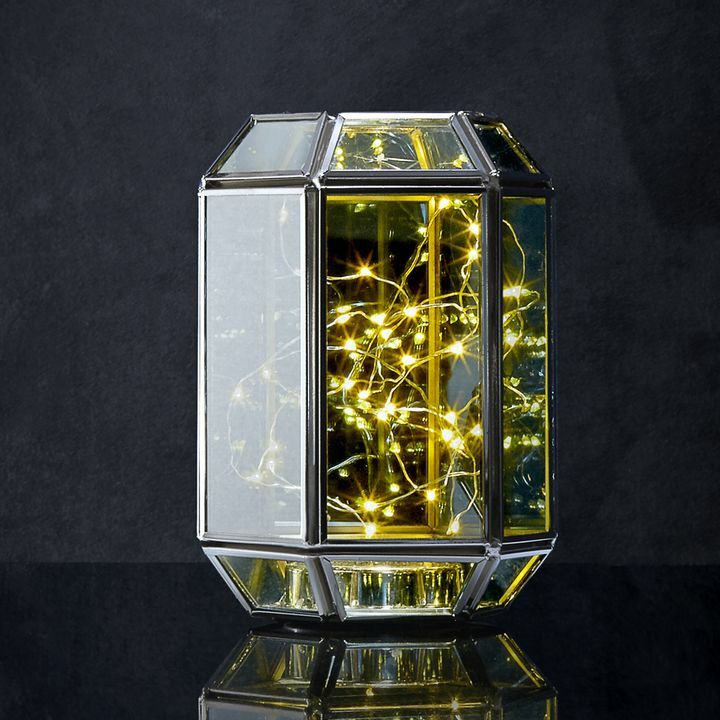 I ordered these lights for my wedding and absolutely loved them! I will be placing a second order soon for pillar sets. Love, love these!!! The remote control make them so easy to display. They were exactly what I was looking for! We have a chandelier made out of an old wagon wheel down in our cabin and had real candles there before, but these little candles and also the ability to use a remote to turn them on was exactly the thing! They are exactly what I wanted and needed! The flame less votives with the remotes was awesome for my daughter's wedding, as we didn't have to go around and turn them all on it made it easy and the lighting that they put off at night was fabulous. I love these lights! They give great ambiance and look good too. The only drawback to these lights is that if you use the remote to shut them off, they aren't truly turned off. Internal signal receiver has to stay on, so it uses up battery even when off. Can only use switch at bottom to actually shut it off and conserve battery. Other than that, I think they are fantastic!!! Can these be used in decorative ceramic houses, like a Christmas village and will the remote work when candles are inside the ceramic buildings? Can I adapt these to fit in an outdoor chandelier that has taper candle holders. I am concerned that if I glue a dowel to the base the on - off switch will not operate. We do not recommend attaching a down to the candles with glue as this would void the warranty. What is the range on the remote? How close do you need to be to the candles to turn them on? The furthest distance the candles are able to sense the remote is 4 feet. The closest would be 1 foot. 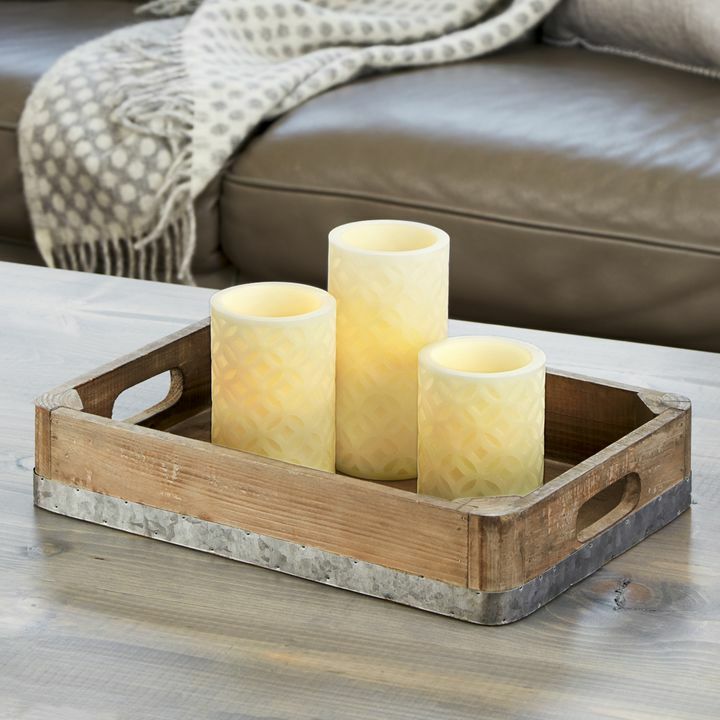 Will these candles fit in small mouth mason jars? Can I set these to go on and off automatically each night? Yes, these have both a 4 and an 8 hour timer. I would like to order extra remotes so that I can give these candles as gifts. Is it possible to purchase extra remotes? You can give us a call at 866.490.9358, we typically sell our remotes for $10 a unit. I purchased 2 sets of the 8 flameless resin votives several weeks ago. They are located on a wall sconce, and not easy to get to. When placing them there, we turned them to 'on' planning to use the remote to activate them. When we tried them a week later, they would no longer come on. Do you know why that would happen? We did replace the battery in the remote, but that did not solve our problem. Thoughts? Thanks! The batteries in these only last about 45 hours on average. They may have just died. If purchased in bulk the batteries can be found relatively cheaply on amazon. 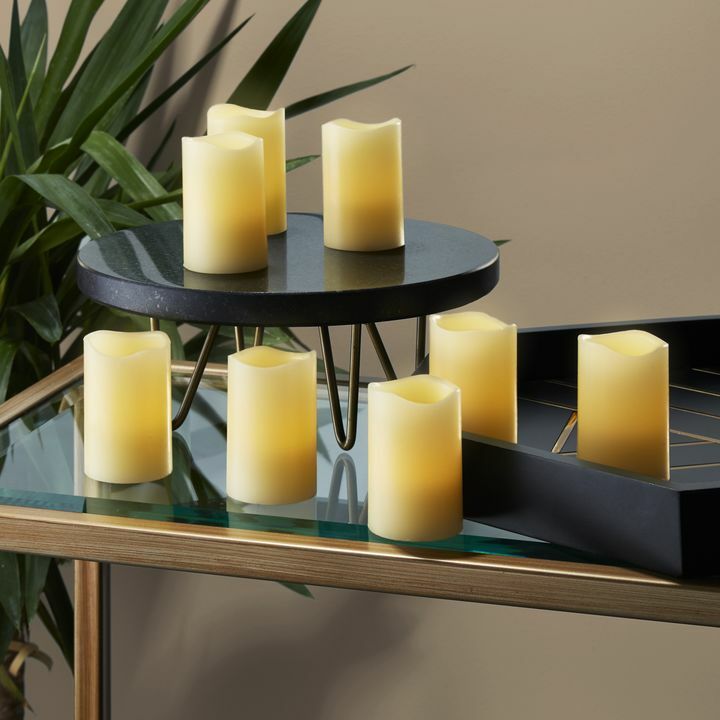 Can these candles be added to the set of 8 with others from a second set of 8? If so, will I need two different remotes (one from each set ) to turn on the 9 candles i need for wall votive holder? If they're all the same type of candle (SKU) then they'll all work off the same 1 remote. Can you tell me about how many hours the battery will last and if the batteries are replaceable? Thank you. The batteries are replaceable and last an average of 45 hours. I am repurposing a chandelier and wondered if these will be safe to use in a standard clear glass stemless wine glass. Yes, they will be safe to be used that way. 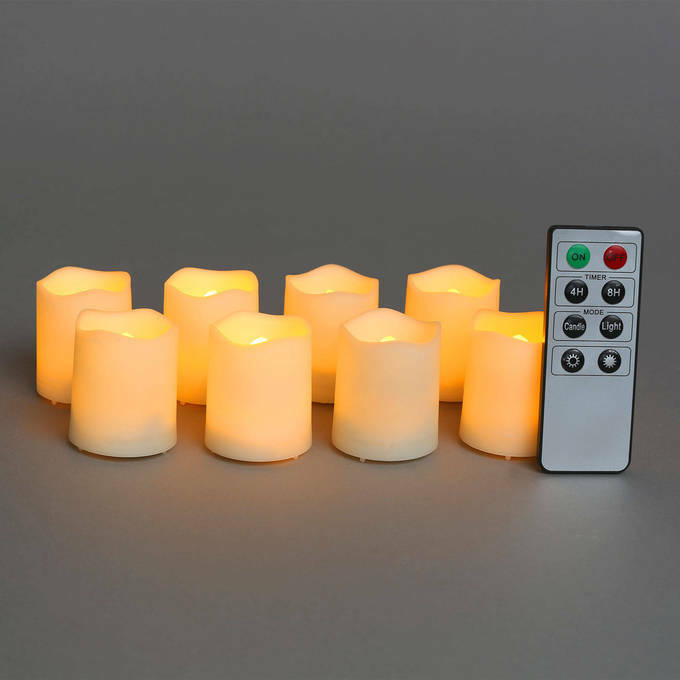 Remote control for \"Melted Edge Flameless Resin Mini Votives with Remote, Set of 8 for $ 24\" can be used for the same product but it's a set of 12 for $14? If so I'd like order both sets and I have one remote. The set of 12 is not remote compatible. How bright are these? 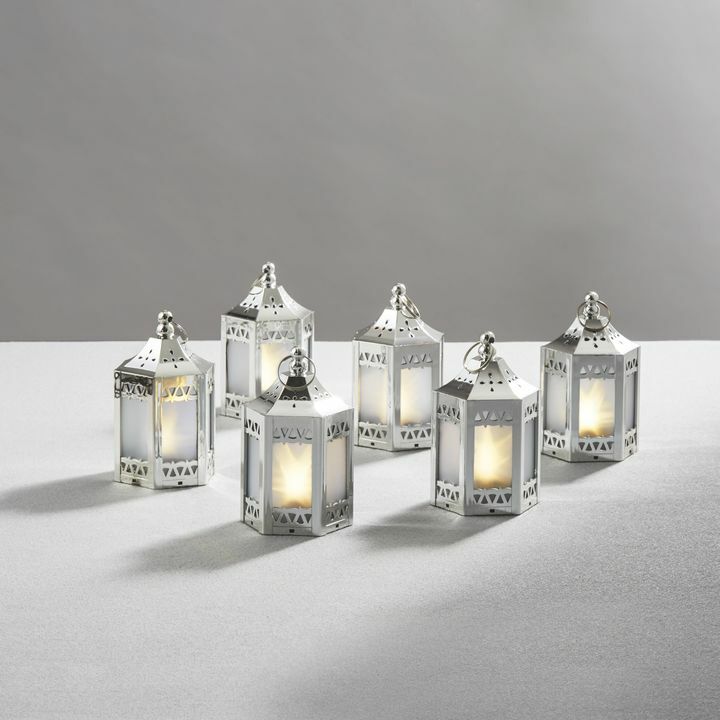 I will be using them to light the tables for an outdoor evening dinner party. Each candle is about 8 watts. 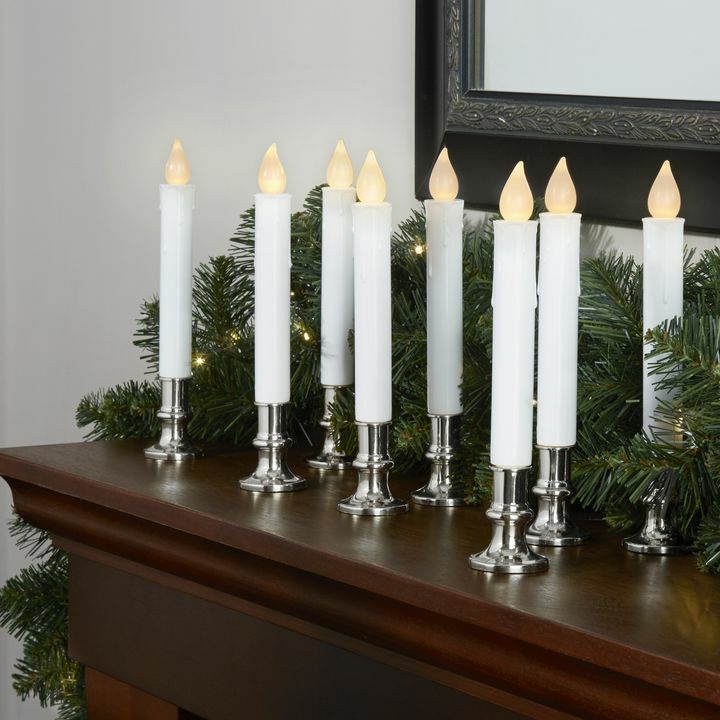 Can these candles be set to turn on automatically at the same time each night or do they have to be turned on remotely each night? 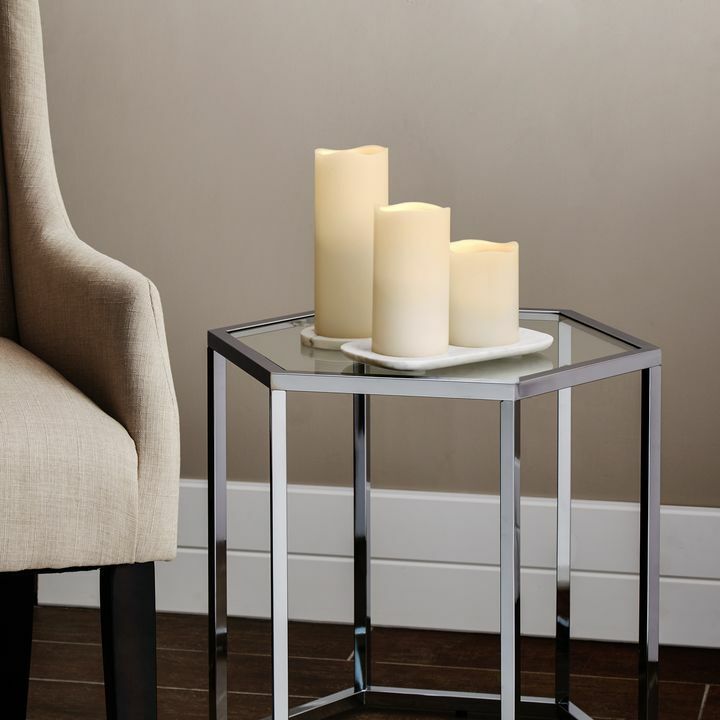 These candles come with a remote with the 4 or 8-hour timer feature. 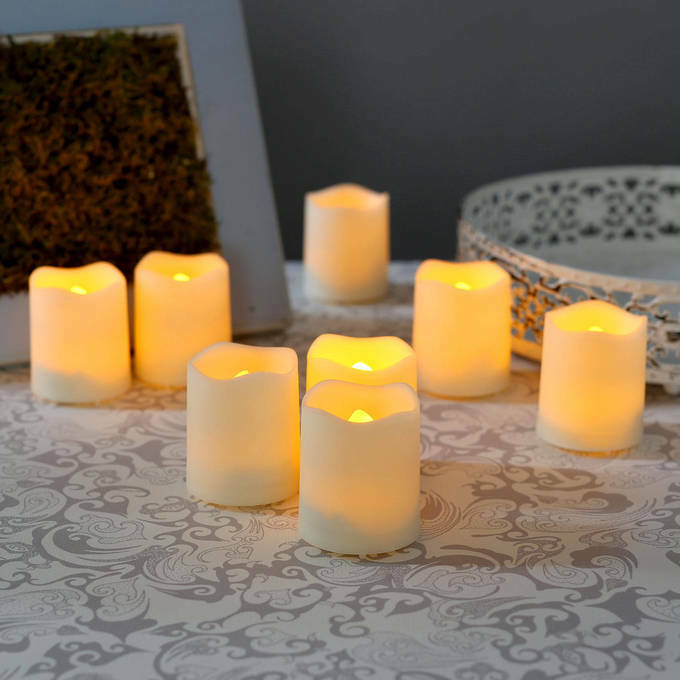 Once you turn the ON/OFF switch on the candles to ON, you can select either the 4-hour or 8-hour timer. It will turn on everyday the same time you set them. 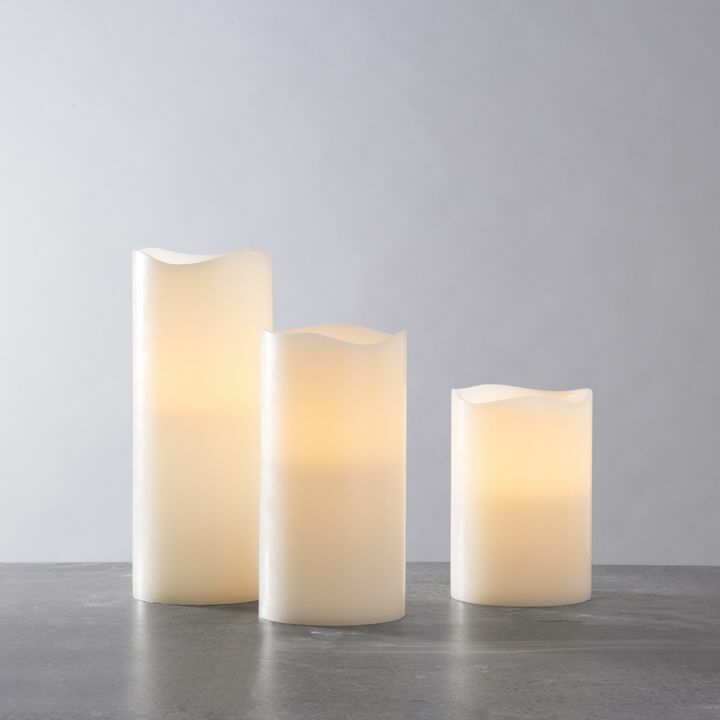 Will these candles fit in votive holders made for tea lights? These are 1.5\" in diameter. As long as the holder is slightly larger than that, sure. I need 9 candles. Is it possible to package these as a set of 9 with a remote, or can the set of 12 be sold with a remote? We are unable to break up a set in order to make 9 candles in a set. If the set of 12 does not come with a remote, it is not remote compatible. what is the diameter of these candles?\"
These candles are 1.5 inches in diameter. If you leave the candle switch in the on position, will the batteries drain even if they are turned off with the remote? They will slightly drain the batteries because the candles need to be remote activate in order to sense the signals from the remote. I recently got a set of your pillar candles with remote. 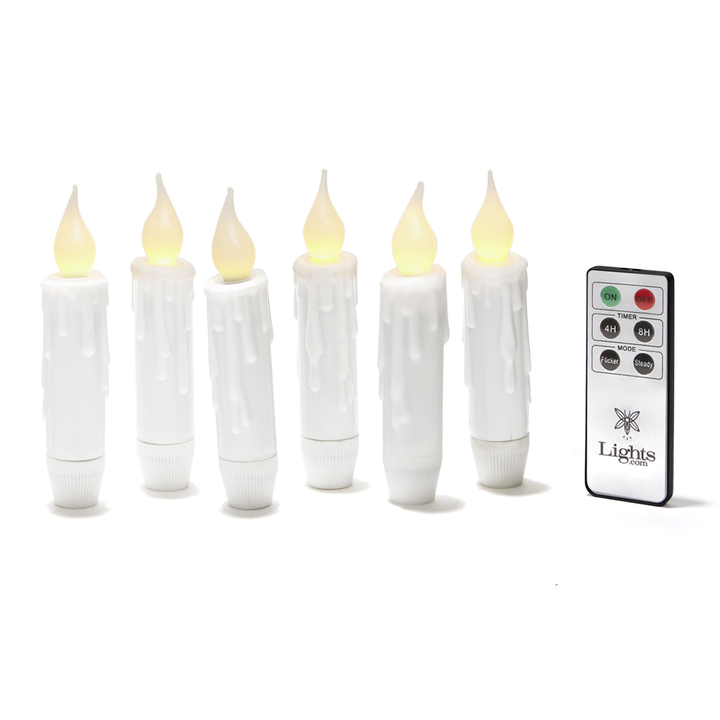 If I buy a set of your votives with remote, will the pillars and votives work off a single remote? Please email us at cs@lights.com and we can further proceed with a replacement order.